To Cite: Choi H Y, Park S Y, Jin W, Park J S, Ryu K N, et al. Simple Bone Cyst with Mesenchymal Proliferation Involving Epiphysis of the Proximal Fibula: A Case Report, Iran J Radiol. 2017 ; 14(4):e34183. doi: 10.5812/iranjradiol.34183. Epiphyseal involvement of a simple bone cyst (SBC) is rare. Furthermore, its pathological variant is even more uncommon. Herein, we report a case of a 22-year-old woman with an SBC containing unusual mesenchymal tissue proliferation with epiphyseal involvement in the proximal fibula. Magnetic resonance imaging showed a cystic lesion that involved the entire epiphysis as well as some soft tissue components. Hence, our initial differential diagnosis did not include SBC. However, pathology confirmed a SBC. Thus, SBC should be considered in the diagnosis of cystic lesions despite the atypical imaging findings. Simple bone cyst (SBC) is a relatively common benign fluid-filled cystic lesion that is typically discovered in the first and second decades of life. Generally, SBC originates from the metaphysis adjacent to the growth plate. SBC does not cross the growth plate and epiphyseal involvement is a rare occurrence. Furthermore, the pathological variant is even more unusual. We report a case of a 22-year-old woman with an SBC containing unusual mesenchymal tissue proliferation with epiphyseal involvement in the proximal fibula. A 22-year-old woman presented for evaluation of a 2-month history of exercise-related left leg pain. There was no history of trauma. There were no other signs or symptoms. Physical examination showed intact strength, sensation, and reflexes in both lower extremities, and a full range of motion. Laboratory findings were within normal limits. The patient underwent plain radiography and magnetic resonance (MR) imaging of the left leg. Plain radiography (Figure 1) of the left knee joint showed a well-defined lytic lesion extending from the proximal metaphysis to the epiphysis of the left fibula with cortical thinning. Balloon-like expansion and endosteal scalloping was seen. In addition, there was no internal sclerosis or cortical disruption. Figure 1. A 22-year-old woman with exercise-related leg pain and no previous history of trauma. Plain radiography of the left knee joint shows a well-defined lytic lesion extending from the metaphysis to the epiphysis of the left fibula. Balloon-like expansion and cortical thinning with endosteal scalloping is also seen. MR imaging showed a T1 slightly high signal and T2 high signal lesion (Figure 2A and B). Axial image revealed dependent layering within the lesion with fluid-fluid level (Figure 2C). It involved nearly the entire epiphysis and to some extent, the metaphysis of the left fibula. In addition, associated bony expansion and endosteal scalloping was seen. There was peripheral rim enhancement of the lesion (Figure 2 D - F). Figure 2. Magnetic resonance imaging of the left leg. A, Coronal T1-weighted (TR/TE, 750/20) fast spin echo image shows a homogeneous low-signal lesion. Note that the lesion contains a small region of lower signal at the lower portion (arrow). B, Coronal T2-weighted (TR/TE, 4104/70) fast spin echo image shows a high signal lesion. There is a heterogeneous low-signal lesion at the lower portion (arrow). C, Axial T2-weighted (TR/TE, 4138/70) fast spin echo image shows fluid-fluid level within the lesion. D, Gadolinium-enhanced T1 (spectral presaturation inversion recovery (SPIR)) coronal image (TR/TE, 601/20) shows rim enhancement at the periphery and a slightly enhancing soft tissue component (arrow). E, Gadolinium-enhanced T1 SPIR axial image (TR/TE, 601/20) shows rim enhancement at the periphery and a slightly enhancing soft tissue component (arrow). F, Gadolinium-enhanced T1 SPIR sagittal image (TR/TE, 601/20) shows rim enhancement at the periphery and a fluid-fluid level. Although definite evidence of fracture was not detected on MR image, this finding can suggest a possibility of microfracture with hemorrhage. Maybe slightly increased signal intensity on T1 weighted image also associated with hemorrhage. In addition, unusual lobulated soft tissue component was seen in the lower portion of the lesion. It had heterogeneously low T1 and T2 signal intensity. Contrast enhancement image showed mild enhancement of the portion. Due to the soft tissue component, our differential diagnosis included giant cell tumor or chondroblastoma with secondary aneurysmal bone cyst. The patient underwent curettage with allo-bone graft insertion for the left proximal fibula. Histologically, the lesion was confirmed as SBC with mesenchymal tissue proliferation consisting of storiform spindle cell (Figure 3). However, cytologic evaluation was not carried out. Figure 3. Pathologic specimen of the left proximal fibula. A, Pathologic specimen shows cholesterol cleft within the lesion. (H&E, ×200). B, Mesenchymal tissue proliferation consists of storiform spindle cells. (H&E, ×200). Solitary SBC occurs most frequently in long tubular bone. They arise in the metaphysis adjacent to the physeal plate. With skeletal growth, the lesion grows away from the physeal plate, so the cyst may appear to migrate into the diaphysis. SBC in adults can usually be seen in the diaphysis. Crossing the growth plate and epiphyseal involvement is considered rare. Cappana et al. reviewed 607 SBC patients and found that only 12 patients were confirmed SBC with epiphyseal involvement (1). Jaffee first reported SBC with epiphyseal involvement, and other authors have reported that lesions in the metaphysis can cross the physeal plate and result in involvement of the epiphyseal area (2-6). Our case showed a cystic lesion that involved the entire epiphysis as well as within the soft tissue component. Therefore, our initial differential diagnosis did not include SBC. This is unusual due to the mesenchymal tissue presenting as a soft tissue component on the MR image. Our initial differential diagnosis was giant cell tumor (GCT) or chondroblastoma with secondary aneurysmal bone cyst. Secondary aneurysmal bone cyst formation of giant cell tumor occurs in up to 14% of cases (7, 8). It may be present in a portion of GCT and fluid-fluid levels are seen throughout lesion on MRI (9). Typically, GCT originates in the metaphysis and extends into the epiphysis, often to near the articular surface that is eccentric in location (9). 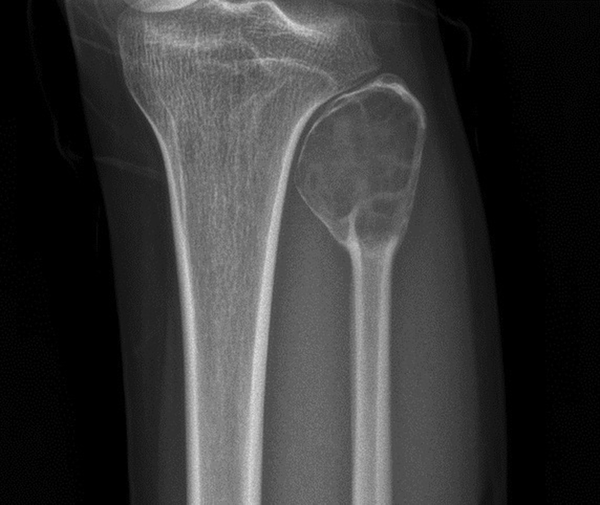 Plain radiography reveals a lytic lesion with a well-defined and non-sclerotic margin. The majority of cases show a geographic appearance with a narrow transition zone. Chondroblastoma is an uncommon benign cartilage tumor. Typically, it occurs in the epiphysis and often extends into the metaphysis. Radiographic findings include a well-defined, lytic geographic lesion eccentrically located. The majority of cases show a thin sclerotic margin. Mild cortical expansion and endosteal scalloping may occur. Periosteal reaction along adjacent metaphysis and internal chondroid matrix can be seen in up to 50% of cases. It may also contain intralesional fluid-fluid levels of secondary aneurysmal bone cyst, in reportedly 10% - 15% of cases (9, 10). Pathologically, it demonstrated cholesterol clefts, scattered giant cells and fibrous depositions compatible with a SBC. Within the lesion, mesenchymal tissue proliferation consisting of storiform spindle cells was seen. Mesenchymal tissue is embryonic connective tissue of the lymphatic and circulatory systems, and connective tissue of the body such as bone and cartilage. This finding is unusual and its etiology is unclear. Growth arrest or shortening as a result of a SBC is relatively uncommon, and most such cases are possibly related to surgical curettage of the epiphysis or previous fractures (4, 6). Epiphyseal involvement of SBC seems to have a greater association with growth arrest or deformity than their metaphyseal lesions (4, 6). Our patient had no evidence of growth arrest or shortening. In conclusion, epiphyseal involvement of a SBC is generally rare. Furthermore, coexisting soft tissue component is even more unusual. Less than 50% of proven simple bone cyst cases meet all criteria. Therefore, SBC should be considered in the diagnosis of cystic lesions even though it is not a common entity. 1. Capanna R, van Horn J, Ruggieri P, Biagini R. Epiphyseal involvement in unicameral bone cysts. Skel Radiology. 1986;15(6):428-32. 2. Andrew H, Haims PD, David P, Javier B. Epiphyseal extension of a unicameral bone cyst. Skeletal Radiol. 1997;26(1):51-4. 3. Gupta AK, Crawford AH. 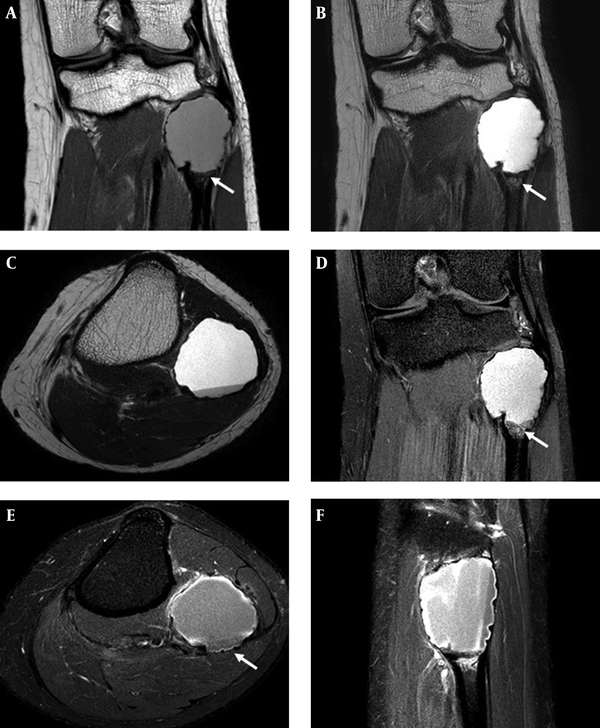 Solitary bone cyst with epiphyseal involvement: confirmation with magnetic resonance imaging. A case report and review of the literature. J Bone Joint Surg Am. 1996;78(6):911-5. [PubMed: 8666611]. 4. Ovadia D, Ezra E, Segev E, Hayek S, Keret D, Wientroub S, et al. Epiphyseal involvement of simple bone cysts. J Pediatr Orthop. 2003;23(2):222-9. [PubMed: 12604955]. 5. Jaffe HL, Lichtenstein L. Solitary unicameral bone cyst with emphasis on the roentgen picture, the pathologic appearance and the pathogenesis. Arch Surg. 1942;44(6):1004-25. 6. Jain SK, Nathan SS. An unusual presentation of a simple bone cyst in the scapula. Musculoskelet Surg. 2012;96(3):227-31. doi: 10.1007/s12306-011-0151-6. [PubMed: 21744025]. 7. Anchan C. Giant cell tumor of bone with secondary aneurysmal bone cyst. Int J Shoulder Surg. 2008;2(3):68. doi: 10.4103/0973-6042.42582. [PubMed: 20300319]. 8. Chakarun CJ, Forrester DM, Gottsegen CJ, Patel DB, White EA, Matcuk GJ. Giant cell tumor of bone: review, mimics, and new developments in treatment. Radiographics. 2013;33(1):197-211. doi: 10.1148/rg.331125089. [PubMed: 23322837]. 9. Manaster B.J, Cheryl A, Petersilge, Catherine C, Roberts, Christopher J, Hanrahan, Sandra Moore. Diagnostic Imaging: Musculoskeletal Non-Traumatic Disease. . Lippincott: Williams and Wilkins; 2012. 10. Ly JQ, LaGatta LM, Beall DP. Calcaneal chondroblastoma with secondary aneurysmal bone cyst. AJR Am J Roentgenol. 2004;182(1):130. doi: 10.2214/ajr.182.1.1820130. [PubMed: 14684525].